Soft-GRAF Studio is an HMI (Human Machine Interface) software developed by ICP DAS which allows user to create his colorful HMI application running with the control logic in the same XP-8147-Atom-CE6/8347-Atom-CE6/8747-AtomCE6, XP-8047-CE6/8347-CE6/8747-CE6, WP-8137/8437/8837, WP-8147/8447/8847, WP-5147/5147-OD and VP-25W7/23W7/4137 ISaGRAF PAC. 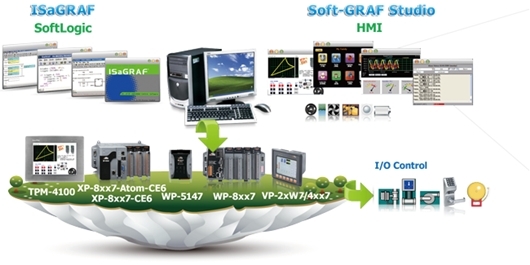 User can edit the HMI screen by Soft-GRAF Studio using the graphical drag and drop operation. And use ISaGRAF to design the control logic by PLC Languages (Ladder, ST, FBD, ......).